As a kid, I loved it when my mom would get the grocery store garlic bread. You know, the kind in the foil bag in the baskets by the cashiers. Okay, I’ll admit it, I still kind of love the stuff. But I find that I like my homemade version better. Less greasy, less overwhelmingly flavored, but still full of that buttery, garlicky goodness. And it’s oh-so-easy to make. You’ll maybe add 5 minutes of prep time to your dinner routine. No biggie at all. Soften butter (leave on the counter for an hour or two or microwave for 10 seconds at power level 2). Mix in all the other ingredients. Spread butter mixture over cut surface of garlic bread. Reassemble loaf of bread and wrap with foil. Bake 15-20 minutes, until inside of bread is hot. Slice and serve! You made me hungry for some Pasta! and this bread!! oh goodness, that sounds heavenly! i LOVE homemade garlic bread. my mom always made it homemade. i never even had “store” garlic bread or texas toast till i was like 15 at a friends house! my mom always melts the butter on the stove with the garlic then brushes it on then puts cheese or herbs on it. 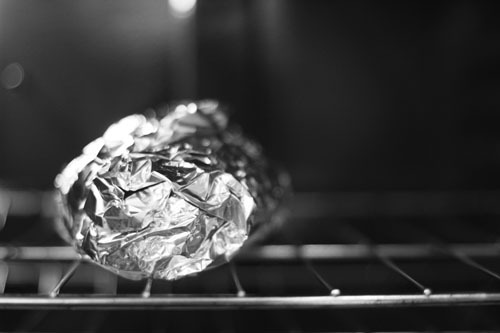 then wraps in foil just like you do. i never really thought about just softening the butter and slathering it on but maybe next time i will try it. I need to buy a french bread pan so that i can attempt to make some gluten free french bread. i haven’t had any now for-e-ver. just regular bread. OMG am i just realizing i haven’t had garlic bread in like a year ??? this must be fixed ! Always love a good garlic bread! We love good garlic bread! So easy to make and goes with almost everything. 1 whole stick of butter….it must taste GOOOOD! I had been using the garlic bread recipe from Our Best Bites that we were quite happy with, but I’m never one to turn down trying something new that sounds really good, and this recipe sounded really good. It reminded me very much of the OBB recipe only a bit different because it uses fresh garlic it’s kicked up about 10 notches and SO much better! My family LOVED it – as long as I have fresh garlic in the house this will be my go to recipe for garlic bread. 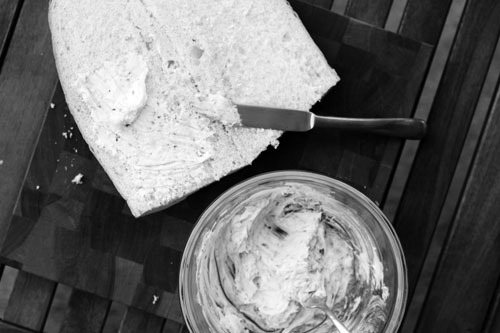 I did mine a little different – rather than slather the bread with the mixture and wrap it in foil to bake, I just spread it on individual slices and toasted them under the broiler. I could have eater the whole pan they were so good! I too have just stuck the bread under the broiler – when I want it to cook quickly. just as delicious! thanks, nicholle – glad it was a success!